City life has always appealed to me, though I cannot say entirely why. The parking problems, the smells, and the proximity of your neighbors are all things that have never allured me but they seem to be minimized by being so close to everything, the eclectic culture, and the idea of being able to wake up and take a stroll to my favorite haunts. 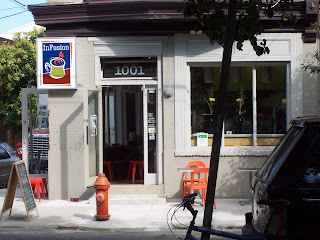 InFusion Coffee and Tea Gallery seems to have that "favorite haunt" feel, having heard lots about them via various Philly food sources (nothing from my coffee resources) and further confirmed by their homey (and heavily residential) surroundings. I arrived with the wife on a day in the city, purposefully out of the way of our usual stops to get my morning coffee from InFusion. The place is in a mostly residential area with a nice store front and it's overtly colorful logo prominently displayed on its gray walls across from a very well-kept city park. The inside of course reflected a much warmer, friendlier tone (though very compact) that you can observe better via this video they sent me last week. As far as their coffee offerings, they offer Torreo and Equal Exchange. I have had Equal Exchange before in several places and it tends to be a heavy-roasted coffee with some rough screams of bitterness. No real experience with Torreo. The coffee they served me was a dark roast which wasn't so bad, but nothing great either. The espresso was decent, with a nice acidity yet nothing to write home about (unless home reads my blog, and then I guess it is?). The tea is free leaf. Men Get Their Coffee Faster? All rights reserved by the Pure Coffee Blog LLC. Watermark theme. Powered by Blogger.